As an author, I have often been told that it is a bad idea to read my reviews. I think this advice is ridiculous. Unless you truly don't care if your books are ever sold or read, how could avoiding your reviews possibly help your effort to sell books? As crass as this may sound to some, the responsibility of a author goes far beyond the application of words to a page. Writers are also business people. Salespeople. Advertisers. Marketers. Brand builders. It is our job to help our books find a way into the hands of readers. It's our job to write and sell books. One of the tools that we have to assist in this process is customer feedback. Whether this comes in the form of a review published in a magazine or newspaper or a customer rating on Amazon, all of this data is valuable to the author if he or she can stand a little criticism. In what other business would the creator of a product ignore the feedback from the customers? When my first novel, Something Missing, published back in 2009, I read the reviews. Admittedly, they were good. The book was reviewed well in newspapers and trade publications, and it averages 4.3 out of 5 stars on Amazon. Still, there was information to be gleaned from both the positive and negative reviews. Primarily, I learned that the books starts out slowly. Even positive reviews comments on the importance of sticking with the story. Allowing it to develop. Waiting for the ball to get rolling. Thanks to my agent, I already knew this might be a problem, but reading reviews from readers helped to cement this notion in my mind. I needed to get my story moving quicker in my next book. My next book, Unexpectedly, Milo, was also reviewed well. Again, it averages 4.3 out of five stars on Amazon, and the newspapers and trades liked the book, too. But once again, negative comments centers on how the plot takes a while to get moving. Again, even positive reviewers advised would-be readers to "give this book a chance" and "just wait because as soon as the plot gets rolling, it never stops." I hadn't learned my lesson. I vowed to do better on the next book. And I did. Memoirs of an Imaginary Friend has been my best reviewed book to date, both in the press as well as by readers. Critiques often centered on the simplicity and repetitive nature of the text, but these elements were intentional. The story is being told by a five year-old imaginary friend. Gone were critiques on slow moving plots. I learned to launch my stories closer to the inciting incident. I learned that shorter chapters make the reader feel like the book is moving along quickly. I learned that the methodical process of meeting the character and discovering his or her world before allowing the plot to take off is not how people enjoy reading stories. It’s not how I enjoy reading stories. I learned all of this by reading my reviews. Writers cannot afford to be so fragile as to avoid reviews. They must learn not to take individual reviews personally, but they must also be on the hunt for patterns in the thoughts and critiques of their readers. We don’t write books in a vacuum. You don’t write books for ourselves. We write books with the hopes that readers will find, read, and love our stories, which means we must be willing to listen to our readers. Find out what they think. Apply those lessons to future stories. I’m not just doing surgery when Plto sits across my forearms. A far more serious piece of business. I stepped away from my laptop mid-sentence to use the bathroom. When I returned, the cats were flanking my laptop, and this is what I found. Why do they always manage to pick off the most-often-used letters? It's like they know. the best way to hurt me. 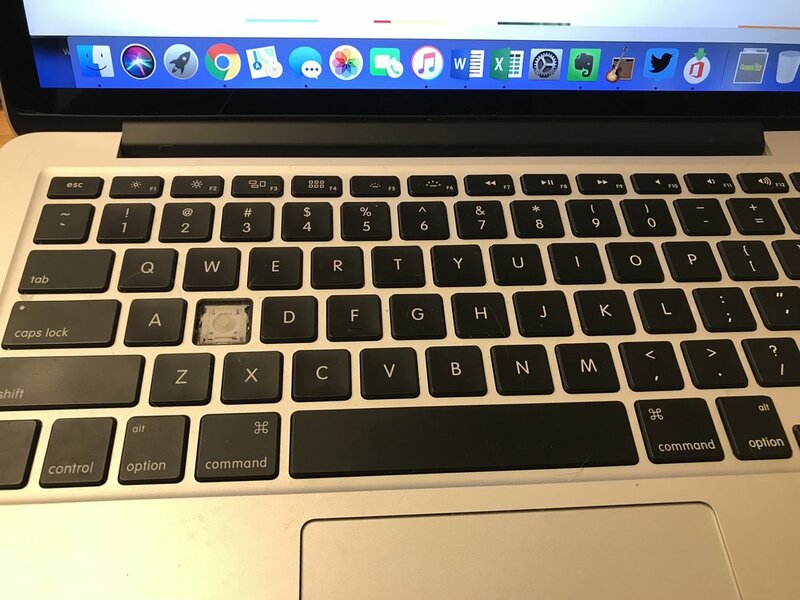 It took me 15 minutes to find the S key. The world does not want me to finish any of these books. Writing is already hard enough without this. I'm trying to complete the revisions of my next adult novel, and it seems like at every turn, someone is hell bent on slowing my progress. Last night it was the cats, Tobi and Pluto, choosing the space on the table directly in front of me to commence their battle. How is a guy expected to get anything done with this to distract him? My wife and kids slow me down. Gloriously so. I loved this dedication by Joseph J. Rotman. While it may seem like he's throwing some shade at his family, I suspect not. 2017 was an exceptionally busy time for me. I completed three books (an adult novel, a middle grade novel, and a book of nonfiction), all within a single calendar year, which means I was sitting at the end of my dining room table a lot, pecking away at the keyboard. And yes, it's true. I could've finished the books much sooner if not for Elysha, Clara, and Charlie, but I wouldn't have it any other way. Thank goodness I didn't finish them sooner, because that would've meant missing out on so much that I love and cherish. I suspect Rotman felt the same way. Then again, Rotman is a Professor of Mathematics at the University of Illinois Urbana-Champaign and has written 10 textbooks. This dedication can be found in An Introduction to Algebraic Topology. He might not be the world's greatest romantic. You often find yourself constantly explaining that yes, it's true. You are in fact a published writer. A paid writer. A professional writer. A person whose career is to assemble words in an entertaining and informative order. While eating large amounts of protein at a tailgate recently, my friend, Shep, joked about how you never know when something you say or do might end up in one of my books. "Wait," the guy standing next to me said. "You really write books?" "Real books?" he asked. "Like on Amazon?" Happily, Shep came to my rescue. "Yes, he publishes books. He gets paid to write them. He writes for magazines and other stuff, too." "Yes, I'm a writer. I've published four novels and have three more, plus a nonfiction book on storytelling, coming out in the next two years. My books have been translated into more than 25 languages, and one of them is an international bestseller. Three are optioned for film. I also write the humor column for a regional magazine and occasional for publications like Parents magazine. And I've been writing a daily blog for more than a decade. Also, I'm not rich. I'm not close to being rich." Hand the card over and end the interrogation. Do you sell books at fairs and farmer's markets and stuff? Are they just e-books that you make on your own? Do you publish with an actual book company? Can I find your books in actual stores? Libraries? Amazon? Do you actually make money on your books? How come I've never heard of you? Do you sell your books out of the back of your car? I suppose there are other professions that get similar questions. If I was a professional baseball player, actor, sculpture, or musician, I might be asked to justify my career, too. If asked what you do for a living, and your answer is, "I'm in a band," you should not be required to provide a tax return in order to prove that you make money playing your guitar and singing backup vocals in your folk-metal fusion quartet. Or that yes, people buy my naked lady sculptures for their gardens. Or yes, I am paid to perform Shakespeare onstage. Or yes, I'm the backup catcher for the Rochester Redwings of the International League. I suppose that because their are no amateur attorneys or accountants or astronauts, it is presumed that these people earn a living from these pursuits, and thus proof of income is not required. After all, I've performed in local theater and never been paid. And my son came home yesterday with a sculpture of a mouse that has yet to receive any offers from collectors. And yes, there was a time when I was writing and not earning any money for my efforts. Still, when someone asks what I do for a living, and I say writer, it would be nice if people would assume that "earning a living" means "Yes, I get paid to write stuff." I was writing this morning. It was quite early. The sun had yet to rise. Words were flowing. Paragraphs were forming. Things were good. Then my daughter, Clara, age 8, appeared at the table. Early. The sun still wasn't up. Clara: "I know Hawaii became a state in 1959. Right?" I had no idea. Maybe? Why are we talking about this at 5:42 AM? Clara: "And before that, Hawaii was a United States territory. Right?" Clara: "But my American Girl book says that Hawaii was the only state in America to enforce laws about people staying in the state, on the island, during World War II. And they were the only state had blackouts from 6:00 PM until 6:00 AM, too. So the Japanese couldn't see them." Clara (rolling her eyes): "But World War II happened in the 1940's, Dad. If Hawaii wasn't a state until 1959, why does the book say that Hawaii was the only state doing those things during World War II? It wasn't a state during World War II." Me: "It's not even six o'clock yet, Clara." Not great. I know. Her response was better. Clara: "That's not an answer, Daddy." And there you have it. The end to the writing that morning. Writing a novel is hard enough already. I don't need these additional challenges. All this before 7:00 AM. I love them dearly, but I've got TWO deadlines for TWO different books creeping up on me, and quiet time in my home is impossible to find. Instead, I'm listening to the kids spell "Nebraska" backwards and puzzle out the four states that begin with the word "New." It's cute, but less so at 6:45 AM. Also, thanks to the cat, the E key on my keyboard is partially detached from constantly coming loose as I type. If I leave my laptop open overnight, he pops the keys out of my keyboard. I'm usually able to snap them back into place, but not the E. The plastic hook that keeps the key down in place snapped in half. Not the Z. Not the 9. Not the semicolon. No, the one key that is permanently broken is the key I strike the most. I sometimes think the universe wants this writing thing to be as absolutely difficult as possible. I'm desperately trying to wrap up the first draft of a new novel and a round of edits on a nonfiction book on storytelling. Both are due in my editors' hands shortly. 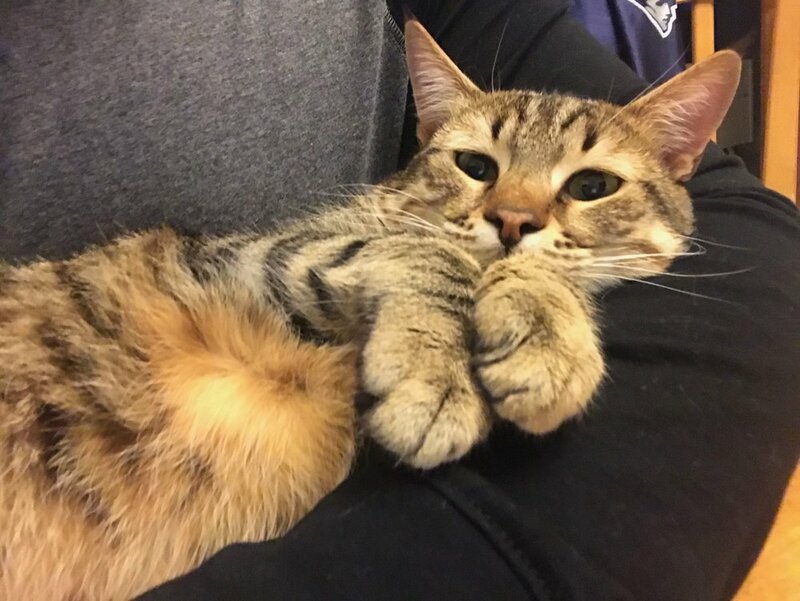 This makes it a lot less cute and a lot more annoying when Pluto sits beside my computer and starts swatting and grabbing my fingers for reasons I will never understand. I've got enough standing in my way of the completion of these books already. The last thing I need is my cat bringing progress to a halt. Teachers: Writers never write one thing at a time. Stop ruining children. If you have writer's block, you don't have enough writing projects. How could I possibly suffer from writer's block with this many projects underway. Stuck on one? Move to another. While teaching a group of about 30 middle and high school students this summer, one of the students asked if it would be okay if she started something new. "Of course," I said. "But why are you asking me for permission?" The young lady explained that her teachers insist that she and her classmates finish one writing project before moving onto the next. "My teacher does the same thing," another student said. My head hit the desk. More than three-quarters of the students reported suffering from similar restrictions, which is, of course, stupid. I know many writers, but I have yet to meet a single one who is only working on one project. While my list of projects is admittedly longer than most, every writer has at least one project on the side, oftentimes in another genre. I can't imagine telling a writer who is suddenly excited about a new idea to finish their current project before trying something new. That is truly one of the stupidest teaching decisions I can imagine. There's nothing wrong with deadlines. "I need that essay done by the end of the month." "You must hand in three poems by Wednesday." "Your research paper is due at the end of March." But to expect that students will work on that one project until the due date is an outstanding way to kill any love that students will develop for writing. It places classroom management ahead of creativity, choice, executive functioning, and an authentic writing process. When it comes to writing, we have an army of educators who are teaching something they never do. Even worse, in many cases, it's something they don't like to do. If you never do it in real life, can you expect to teach it to novices? If teachers were writing, they would understand the need to have multiple projects in a writer's life. They would understand the insatiable excitement of a new idea. The need to turn away from a project when enthusiasm wanes. The ability for writers to manage more than one writing project at a time. I felt so much sympathy for the two dozen or so students who said that they would returning to classrooms in the fall where they could only write one thing at a time. I told them to rise up. Declare their writing independence. Insist that their needs be met. Demand to be treated like writers. I also gave them my phone number. "If your rebellion fails, tell your teacher to call me. I'll see what I can do." I'm expecting a lot of phone calls. I wrote on an island. Under a tree. In the middle of a parking lot. I arrived at the dentist office at 1:40 PM for a 2:00 PM appointment. With a book due in less than a week, I was anxious to return to the manuscript. The dentist has a television in the waiting room, so rather than trying to write with a talking head yammering in the background, I took a seat beneath a small tree on an island in the center of the parking lot and worked for 15 minutes. I finished a chapter and revised the end of another. I have yet to meet a published writer who suffers from any of these limitations. I also like to remind these tragically limited writers that soldiers wrote poetry, letters, and novels in the trenches of World War I while wearing gas masks. John McCrae wrote "In Flanders Field" after presiding over the funeral of friend and fellow soldier Lieutenant Alexis Helmer, who died in the Second Battle of Ypres. Thank goodness he didn't need a cappuccino to write one of the great poems of the twentieth century. I don't waste a minute. Rather than being precious about my time, I believe my time to be precious. Instead of waiting for ideal conditions to complete tasks and accomplish goals, I take what I can get, when I can get it. Time is our greatest commodity, so I don't wait a minute of it. Writing a novel is hard enough. I really don't need this added nonsense. And it's so much fun to insert into a student's piece of writing again and again.. The New York Times ran a piece a few years ago that featured 25 "writers' rooms." That same year, The Hartford Courant did a feature on me that included my writing space, which was and still is the end of the dining room table. I'm still on the end of the dining room table. Charlie is much larger now and more mobile, making him even more capable of distracting me with pleas to build railroad tracks, wrestle, or play "Star Whores." I've migrated from Windows to Mac. The bottom shelf of my bookcase is now filled with games and puzzles. But that's about it. Unless I leave the house to write in the library or McDonald's, I sit in the center of my home, head down, oftentimes with headphones blaring rock 'n roll to drown out the noise. Those lovely, well lit, perfectly appointed writers' spaces featured in the New York Times? I wish I could say I don't need a space of my own to work, but in truth, I want one so badly. I dream of the day when I can have a door to close off the rest of the world. A simple door that would allow me to focus and concentrate on the work and not on the 10,000 other things going on around me. Until then, I get by. I wake up at 4:30 so I can have a couple hours of silence. I hunker with headphones and mental blinders and write. I sit in quiet libraries and white-noise filled McDonald's and any other place I can find and work like hell so I can get home. But someday, maybe, I will simply shut a door in my home and work like those writers featured in the New York Times. Won't that be a blessed day indeed. Say no to "more details." Parents and teachers often tell students to "add more details" when commenting on student writing. It's one of the least helpful things that you can say to a writer. Have you ever finished a novel or essay or memoir and wished that the author had included "more details?" Teachers and parents say this to students because so many of them are not writers and do not seriously engage in the writing process. As a result, they simply don't know what to say in the same way I could say nothing to a apprentice carpenter or a beginning skier. If you don't engage in the craft, you will have little to say about the craft. So rather than talking about craft, parents and teachers see quantity as quality. They believe - with all their heart - that an argument that be effectively made in 250 words is automatically made more effective if written with 500 or 1,000 words. Don't seek quantity. Seek quality. Rather than waxing on for paragraphs about a person or place, find the two or three words or phrases that capture the essence of the person or place, and leave it at that. The best writers don't choose the most words. They choose the right words. Got kids? Here's how to turn them into writers. As a teacher and a writer, I often give parents advice on helping their children to become effective writers who (more importantly) love to write. Be the best audience possible for your child’s work. If he or she wants to read something to you, drop everything. Allow the chicken to burn in the frying pan. Allow the phone to ring off the hook. Give your child your full and complete attention. When a child reads something that they have written to someone who they love and respect, it is the most important thing happening in the world at that moment. Treat is as such. Don’t look at the piece. Don’t even touch the piece. Any comment made about the piece should never be about handwriting, spelling, punctuation, and the like. By never seeing the actual text, you innate, insatiable parental need to comment on these things will be properly stifled. Your child does not want to hear about your thoughts on punctuation or the neatness of their printing. No writer does. Your child has given birth to something from the heart and mind. Treat it with reverence. Speak about how it makes you feel. Rave about the ideas and images. Talk about the word choices that you loved. Compliment the title. Ask for more. Forget the rest. Remember: Rough drafts are supposed to be rough. Even final drafts are not meant to be perfect. That’s why editors exist. Go online and look at the rough drafts of EB White’s Charlotte’s Web. They’re almost illegible. Who cares? Writing is messy. Once your child has finished reading the piece, offer three positive statements about the writing. Compliments. Nothing more. Only after you have said three positive things may you offer a suggestion. Maintain this 3:1 compliment/criticism ratio always. Use the word “could” instead of “should” when commenting. If your child asks how to spell a word, spell it. Sending a child to the dictionary to find the spelling of a word is an act of cruelty and a surefire way to make writing less fun. You probably so this because it was the way that your parents and teachers treated you, but it didn’t help you one bit. It only turned writing into a chore. If you were to ask a colleague how to spell a word, you wouldn’t expect to be sent to the dictionary. That would be rude, The same holds true for your child. Also, the dictionary was not designed for this purpose. It’s an alphabetical list of definitions and other information about words, but is wasn’t meant for spelling. Just watch a first grader look for the word “phone” in the F section of the dictionary and you will quickly realize how inefficient and pointless this process is. When it comes to writing, the most important job for parents and teachers is to ensure that kids learn to love to write. If a child enjoys putting words on a page, even if those words are poorly spelled, slightly illegible, and not entirely comprehensible, that’s okay. The skills and strategies for effective writing will come in time, though direct instruction, lots of practice, and a little osmosis. The challenge – the mountain to climb – is getting a child to love writing. Make that your primary objective. Make that your only objective. Do everything you can to ensure that your child loves the writing process. Once you and your child achieve that summit, the rest will fall into place. Except for the handwriting. Sometimes there’s nothing we can do about that. Just be grateful that we live in a world where most of the writing is done on a computer.